USBA Featherweight Champion Jose Haro is from West Jordan, Utah, and won the title back in June knocking out Daniel Franco in the 8th round. He won every round up until then and scored a pair of knockdowns with the second one putting Franco out cold. Haro, 14-1-1 (8), turned professional in August of 2010 winning his first 8 fights in Utah. Taking a fight with Toka Kahn Clary, 11-0, in June of 2014 coming off 10 months of inactivity he lost a hard fought 6 round decision at Bally’s in Atlantic City, NJ. Clary is currently No. 14 in the WBA. Four months later Haro was in with tough Jorge Diaz, 18-3, in Somerset, NJ, ending in a split decision draw. Each boxer got a vote with the third judge calling it a draw. It would be 7 months later before Haro fought again defeating Efrain Esquivias, 17-3-1, who had a knockout win over former world champion Rafael Marquez. The Esquivias fight was in Double Tree, Ontario, CA, as was his next fight with Juan Reyes. Two wins would follow the Esquivias fight starting 2 months later when Haro defeated Miguel Tamayo, 17-13-2, of Mexico, with 15 knockouts. Haro would come back 2 months later defeating Juan Reyes, 12-2-3, a Mexican from CA. In 2016 Haro finding it hard getting good opposition due to his ring success won a pair of fights 7 months after the Reyes fight defeating Raymond Chaco, 6-17, back in Layton, Utah, in April. He would follow this up in July stopping Sergio Nagera, 11-25-2 in 4 rounds. 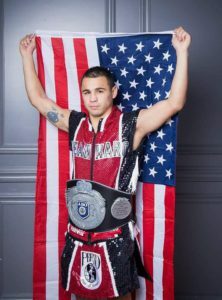 Haro would be off close to a year when the fight with Roc Nation’s Daniel Franco was offered for the vacant USBA Featherweight title in June of 2017. Haro won every round starting to hurt Franco as early as the third round. In the fifth round Franco was warned for hitting behind the head of Haro. In the sixth round with Haro working Franco over good the referee warned Franco for holding. In the fatal 8th round Haro rocked Franco with a hard right spinning him around and down he went which was a delayed knockdown. Franco’s corner could have thrown in the towel then but let it go on with just over 2 minutes left in the round. Haro went right after Franco who was bleeding from the nose. Another hard right and down went Franco face first with the referee immediately waving the fight over at 2:43 of the 8th round in a scheduled 10. Franco was carried out in a stretcher. Haro told the ring commentator, “if it wasn’t for my wife I couldn’t do it.” They (Yesenia) have 5 children, Evenie 10, Alli 8, Haley 5 “Nugget”, Riley 3 and Louie 7 months. He is up at 3am each morning and off to work at 4. He then finishes his job and comes home so his wife can go to work. There is not much money when you are coming up like Haro is. Haro has told his trainer Eric, his brother that if he is taking a beating stop the fight. He has a wife and 5 children to think of. He has had a lot on his mind since Franco went into a coma for 9 days and needed 4 brain operations. Franco feels Jay-Z who owns Roc-Nation has thrown him under the bus. Haro was a victim of a hate crime being shot in both feet and told he may never walk again in 2015. He overcame plenty of troubles but regained his health to fight again. He broke his foot a year later in October of 2016 after this and His agent is Whitfield Haydon. Haro is ranked No. 15 by the IBF due to winning the USBA title. He had plenty of amateur experience with over 100 fights only losing 15 of them. Please keep Haro and of course Franco in prayer. He is currently scheduled to fight for Top Rank in February. “My main purpose for fighting is to fight the best and hope someday make enough money to pay off my mortgage and leave this sport with good health. Once I am done with my career I would like to open my own boxing gym and help the youth in any way I can and watch my kids grow up,” said Haro.